Home Craps at online casinos Craps strategies How to Win at Craps Tournament? Some regular craps players appear to be ill at ease at craps tournament, and no wonder. The main difference here lies in the fact that in tournaments players are contesting against their counterparts and not against the house as they are used to in commonplace craps game. Therefore all the participants are to keep an eye on other players and use certain strategies to win the event. So, if you want to succeed in craps tournament, be ready to take into consideration the following. As any other tournaments in any other casino games, craps tourneys require the players to buy-in before participation. Some online casinos welcome their players to the craps freerolls, but it mostly occurs in the frame of promotions or other incentives for depositing or active play. If you plan to take part in serious craps event and lay a claim to get substantial profit, consider contests with buy-ins. Entry fees vary from $50 to $1,000 and above. Many land-based casinos offer its visitors event participation, accommodation, party invitation and other gifts included into buy-in cost. The prize pool depends on the participants’ number, though tournament organizers can set a guarantee. Different tourneys last differently: one finish in an hour, others spread to several days. If you know the duration of the contest, you will be able to assess your chances more accurate. If you are playing in a big tournament, make sure whether it is divided into several rounds or not. What does it mean? Each round is similar to the small contest in the frame of a big tourney. Players that win in the 1st round proceed to the 2nd and so on. Learn the rules of the event before taking part in it, as they can be different not only for every contest but also for every round. E.g. in one event you may be required to place Pass/Don’t Pass bet on each play plus any other bets you would like to make. In other you are to allow open access to your chips, so that your opponents could see your stack. In still other you may place proposition bets, but their size is restricted to $30. Small tournaments will allow you to play with your own money and buy chips from the dealer. 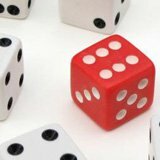 All the important nuances atypical to the standard craps rules are usually explained to the participants before the event start, so be attentive to all the announcements. Always remember that you are playing against your opponents, so you should constantly keep a watchful eye on their actions and chips in order to properly adjust your game. There are conservative and aggressive players at tournament craps tables. The first ones usually play Pass/Come with max odds, while the second ones prefer to make Hardways and Proposition bets. Not every player can cope with opponents’ aggression, but you are not of that kind, right? So if you happen to play against aggressive rivals, try to stand out of the crowd and run counter to your neighbors – in other words, be inventive and bet the way you are not expected to bet. E.g. wait for 2 consecutive points and then switch to Don’t Pass/Don’t Come bets. On the last stage of the craps tournament be ready to use an extra-aggressive style if you are not leading the game. In some cases it even means placing all the chips on one number! Not everyone likes to play craps tournaments and not everyone is able to succeed in such events. However, you can always enjoy and assess your forces in freerolls or cheap tourneys. Besides, who dares, wins!